Phil Godman, the 29-year-old Edinburgh Rugby stand-off and Tom Ryder, the 26-year-old Glasgow Warriors lock, have been called into the Scotland squad for the opening two games of the RBS 6 Nations Championship. Godman, hero of Edinburgh’s Heineken Cup victory in Paris against Racing Metro 92 last weekend courtesy of a last-gasp snap drop-goal, has been added to the squad for training at St Andrews next week. He is enlisted as Ruaridh Jackson has not yet returned to match action following the leg injury that forced his departure during Glasgow’s RaboDirect PRO12 match at Llanelli earlier this month. Ryder has been called up after Fraser McKenzie injured his arm in Amlin Challenge Cup action for Sale Sharks against Brive last night. McKenzie will be seen by a specialist surgeon but has been ruled out of action in the immediate future. 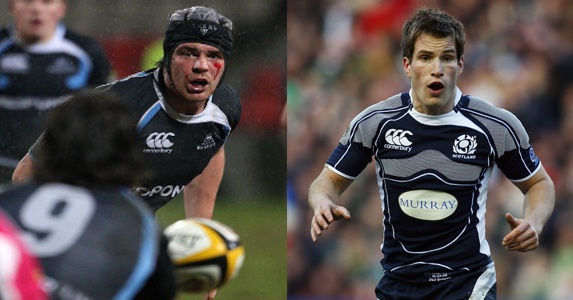 Ryder has since become a key member of the Glasgow front eight, making 29 appearances in the RaboDirect PRO12 and a further six in the Heineken Cup. He helped Scotland A achieve a 100% record in season 2010/11, impressing in the wins over USA Eagles and Italy A.
Godman, who won the last of his 23 caps in the 2010 RBS 6 Nations against England, has recovered from a knee injury in training in September 2010 to return to Edinburgh duty and is expected to feature in Edinburgh’s squad for their vital Heineken Cup tie against London Irish at Murrayfield on Sunday (kick-off 3.15pm). Ryder, the 6ft 5in, 18st 6lb lock, who qualifies for Scotland through his Glaswegian father, Paul, joined Glasgow Warriors from English Premiership outfit, Saracens, on a two-month loan in August 2010 and impressed to the extent where he was invited to make the arrangement permanent.